If you haven’t already guessed, I’m a pretty obsessive person. This caused me some trouble when I was younger (don’t ask me how I broke my nose in college), but as I got older, and learned to channel this energy toward more productive ends, I found that obsession could have a positive side, too. When it comes to my kids and their bilingual development, one of the useful benefits of being obsessive—of keeping this challenge continuously in mind—is the curious way the things I read and experience regularly inspire new ideas that can strengthen my efforts. Like putting rats in the bathroom. This all started when I read an interesting article in The New Yorker called Why We Should Memorize. Written by the poet and professor Brad Leithauser, the article explores the value of memorizing poetry in a day and age when, with computers and smartphones always at our fingertips, we have no apparent need to memorize anything at all. Reading these words, I couldn’t help wondering: Would some form of memorization in the minority language (in my case, that’s English) benefit my own kids by enabling the targeted text to sink to that “deeper, bodily level” where language becomes fully organic and heartfelt? Since they seem to remember the lyrics to favorite songs so easily, couldn’t I take advantage of the same rhythm and rhyme found in poetry to actively nurture more sophisticated forms of language, including advanced vocabulary? 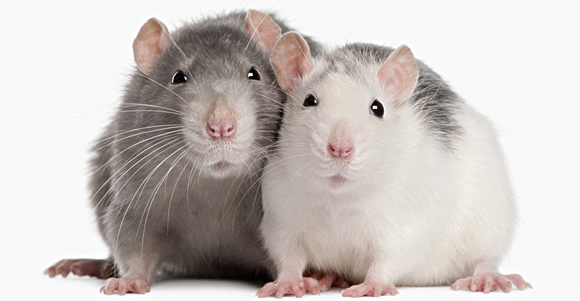 That’s when I thought of the rats. Over the past six months, I’ve been reading a lot of poetry by Jack Prelutsky at home. Eventually, I’ll devote a whole post to this author and his work, but for the moment, let me just say that Prelutsky is a brilliant and prolific poet who was named the first Children’s Poet Laureate of the United States in 2006. The thing is, his whimsical poems are not at all watered down for kids—the language is so rich, so sophisticated that some of the vocabulary even goes over my head. How about this first stanza from the poem “Song of the Gloopy Gloppers”? At first, I wasn’t sure Prelutsky’s poetry would appeal to my kids. I thought they might just sit there scratching their mucilaginous heads. 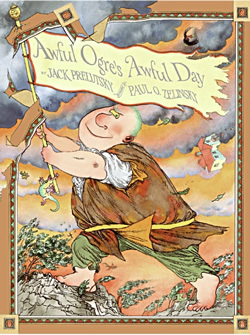 But from the first pages of Awful Ogre’s Awful Day—a tour de force of dark wit and wordplay, illustrated by the great Paul Zelinsky—they were clearly hooked. And it struck me: Children don’t need to understand every word of a poem to follow the text and benefit from the language exposure. Of course, I’m not suggesting that we read Shakespeare to them (yet); the text can’t be too difficult for their level and the theme must appeal to them. But if those two conditions are met, the unfamiliar words can simply waft over them like music, sowing seeds of vocabulary in their little heads, as they enjoy the verse and the tale it tells. Rat for lunch! Rat for lunch! Yum! Delicious! Munch munch munch! Rat, oh rat, oh rat for lunch! In fact, they clamored to hear the poem so often that finally the words began to stick, and they took to strutting about the house and chanting the parts they remembered. And then, when I finally played the CD that came with the book, in which many of the poems have been set to music, “Rat for Lunch!” quickly morphed into the family anthem. With the CD blaring in the background, they started marching and singing, day after day, at the top of their lungs: Rat for lunch! Rat for lunch! Yum! Delicious! Munch munch munch! Now I have to admit, this soon drove me completely mad—I mean, I even spent a long, restless night with the song spinning round and round in my head. At the same time, since they were still stumbling through the more difficult vocabulary in the poem, I couldn’t help attempting a little experiment to see if these tougher words could be encouraged to stick, too. I’ve written a number of posts on “captive reading” and its benefits, including What Is Captive Reading and How Will It Help My Bilingual Child? Basically, captive reading is a strategy for increasing the amount of time a child spends reading independently in the minority language by posting suitable stories and other texts in a “captive location” in the home. For us, that location is the bathroom—specifically, the inside of the bathroom door. Lately, I’ve been writing “serial stories” for my kids, posting a new page in the bathroom every couple of days. (For all the details on “serial stories,” see Turn Your Kids into Eager Readers with This Fun, Simple Strategy.) I was now wondering, though, if captive reading could help my kids remember all the words to “Rat for Lunch!”—even the harder words—so I copied the poem and posted it on the bathroom door, too. but for lunch a rat is tops. With “rats in the bathroom” a success, I plan to continue making use of this new captive reading tactic by putting a series of other creatures in the bathroom, too, courtesy of Jack Prelutsky: tigers, elephants, dragons, ogres, even gloopy gloppers. I also may follow the example of Brad Leithauser’s mother when he was a boy: she would pay him a penny for each line of verse he memorized. How about you? What do you think of posting poetry in the bathroom, or other “captive reading location”? Mucilaginous! I don’t know about the kids, but that might become *my* favourite word! Love the idea of using poetry. My boys have to memorize poems for school (in German) but I haven’t tried it with English. We do have a lovely book of kids’ poetry, though, which they all really enjoy. If anyone’s interested, it’s called Poetry Speaks to Children and includes a CD. We have his book, “The Dragons Are Singing Tonight” and the kids love it. They are also huge fans of Shel Silverstein – we got one of his CDs as well, and they loved listening in the car when they were younger. My daughter is now 11 and often writes poetry in the style of Shel Silverstein. Anne, yes, we love Shel Silverstein, too. I’ve found his collections of poetry particularly useful for reading aloud at odd moments, like when the kids are getting ready for bed, because you can read as few or as many poems as you have time for—it’s easy to stop at any point. And his voice and artwork are so unique, so captivating. ok this post totally blew my mind. And I loved that New Yorker article. I am so excited to discover all this great poetry for kids. My girls love learning things by heart. I am so grateful to have discovered your blog through the carnival. Thanks for participating! Cordelia, I’m happy I was able to blow your mind with this post. That was my sincere hope. I enjoy your blog, too (http://www.multilingualmama.com). You’re a spirited writer with an engaging set of circumstances. Keep up the good work in Thailand! Irma, I’m grateful for your kind feedback. And thanks for the link—it’s a really fun, whimsical song. I wasn’t familiar with Bernard Carney, but I’m now curious to learn more about his work!